Until recently, teleportation of any kind had been considered an impossibility, but with the advent of Quantum Teleportation this is starting to change! The key to QT lies in a critical phenomenon interlinked with Quantum Entanglement, which is already a super enigmatic subject of Quantum Mechanics. QE gets even more mysterious when we cross over into the subject of Entanglement Swapping. In Entanglement Swapping, one particle of a Quantum Entangled pair becomes entangled with a third particle, which itself becomes entangled with the other particle in the first pair, even though the two never interact! The key aspect of Quantum Entanglement transport is that scientists are now developing systems where entangled photons, which instantaneously correlate with one another, travel over significant distances to transport information exactly and with high security. This is Quantum Teleportation over short distances because it only works over a few hundred miles until there is signal loss! For QT over longer distances, Entanglement Swapping becomes necessary: repeaters are placed along the quantum channel and there the photons which come from different pairs swap information to transmit it along much longer distances! Whilst this is wondrous in itself, it gets even more wonderful when we realise that quantum photon pairs swap information to create a communication path but they are photon pairs that never actually interact with each other! 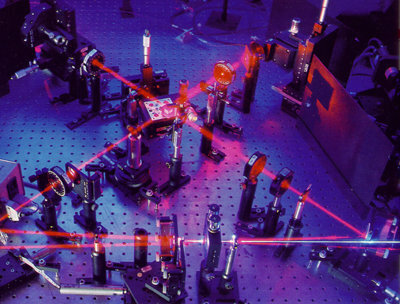 Quantum Teleportation experiments were first conceived by an international group of researchers in 1993. They made use of one of the more unusual aspects of Quantum Mechanics, the Einstein-Podolsky-Rosen (EPR) correlation, more commonly known as Quantum Entanglement. Albert Einstein himself was quoted as describing this effect as "Spukhafte Fernwirkung" or "Spooky action at a distance" because of it's very nature: altering one particle of an entangled pair causes the other to be affected in a highly correlated way without any direct communication between the two! Sound familiar? Welcome to Holistic Quantum Relativity which is essentially about the Supra Universal Consciousness! Finally, physicists seem to be discovering ways in which, without direct interaction, photons are creating efficient and resilient transmission channels. Human beings in true love have known about this for a long time! The Spiritual Mystics, Mothers and Children, True Lovers, can all testify to Quantum Entanglement and Quantum Teleportation of Information Intelligence over vast distances without direct contact! Isn't this part of the eternal saga of trans-universal vibrational union or "Word" manifest as light and sound, which all the spiritual faiths across the world speak of? The 101st image added to the "E8 Album" within the HQR initiative is of Quantum Teleportation! Visit here to view the image and to contribute to the Socratic dialogue: http://ow.ly/pQEf The "E8 Album" photos at http://ow.ly/kGJj are visual intersections of Spirituality, Science, Art and Sustainability! Feel free to share them on your FB page by clicking share or you can tag yourself!